The wide-open shelter with garage doors and wall panels of translucent plastic houses a cherry red Mercedes roadster and a hobby shop. 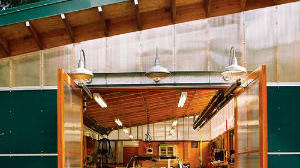 A desire to have minimal impact on the environment inspired the design of this handsome garage in western Washington. “We just couldn’t see ourselves adding to the impervious surface area of our community,” says homeowner Susan Sproull, who wanted to create a shelter for her vintage roadster as well as a workshop for custom woodworking projects. Susan, along with husband Jim, is involved in an environmentally focused nonprofit neighborhood organization; in 2003, the Sproulls’ yard was certified as a Washington Department of Fish and Wildlife Backyard Wildlife Sanctuary. Architect Rob Harrison positioned the 20- by 40-foot shed-roof structure outside the dripline of a mature Douglas fir tree. He planted the roof with drought-tolerant sedums and wildflowers. Translucent polycarbonate panels cover the garage’s upper wall sections, wrapping the structure like a clerestory window and allowing natural light to brighten the space (which cuts down on energy use). The green roof is heavier than a standard roof, but because of its thinness―only 4 inches of soil―Harrison was able to compensate for the extra weight by using roof rafters of laminated veneer lumber (LVL), which is stronger than wood. To conserve energy, Harrison installed an infrared radiant heating system, which warms people and objects rather than air. For insulation, he used blown-in cellulose (recycled newspaper). Many of the materials used inside Susan and Jim Sproull’s backyard structure had a past life or are eco-conscious in their own right. The long workbench and shelving in the garage are made from sections of a yellow pine bowling-alley lane. Behind the table is a floor cabinet used for storing tools; the drawers came from a school science-display cabinet. The wall-mounted glass-front cabinet for hobby supplies is a vintage kitchen cupboard. The building is wrapped in a ribbon of translucent polycarbonate panels, which suffuse it with natural light. What’s more, the architect employed a building technique called stack framing, which uses 25 percent less lumber than conventional construction. Exterior walls are covered in fiber-cement panels from . A carpet of plants on the roof provides insulation and matches the surrounding meadow, which makes the little building blend into its environment. When surrounding trees cast their shadows, the dark green walls effectively disappear. Construction: Jon Alexander, Sunshine Construction, Seattle (206/782-4619).